Hello!! I've been having so much fun dipping into the ginormous pile of photos from our family photo shoot. This weekend I participated in an online challenge to use some older items in your stash, so I pulled out my beloved Sassafras. I have a HUGE pile of it that I purchased from someone de-stashing a few years ago. As I looked over my pretty papers, I couldn't believe I hadn't been using the heck out of it! Sure, I've been hoarding it a bit, but it's just too pretty not to use. I just love Sassafras! 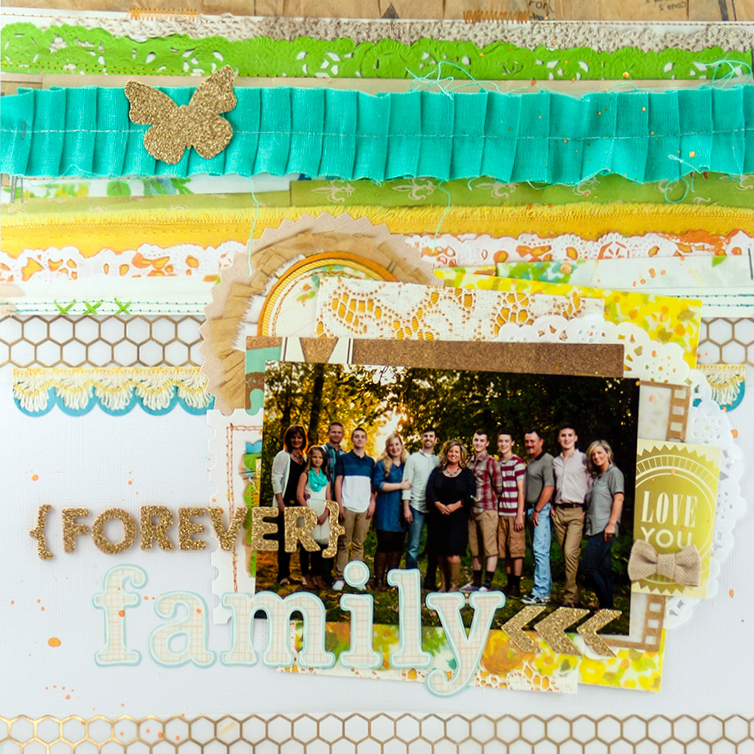 I used the Mix & Mend collection to create this layout, mixed with a few other embellishments and pops of gold. I found that cute pleated ribbon for $1 at Michael's the other day. I love the dimension it adds to the page! I'm pretty sure gold goes with everything. I added lots to this page! I'm feeling super inspired to use my Sassafras right now. Do you have any left? Or is there another brand that you love and miss? I still have plenty of Sassafras. I adore Indie Girl the most I think, but love Sunshine Broadcast as a close runner-up. I also love their deer and their lace/embroidery/fabric style textures--like in the Serendipity collections of Fawnd of You and Woodland Whimsy. Love how you used the Sassafras, Allie! It was one of my favorites, too! Great layout to document your photo! !